An online knowledge hub designed to help you learn about ethics and professional conduct. Buy isurv Professional Conduct for just £300 + VAT per year. 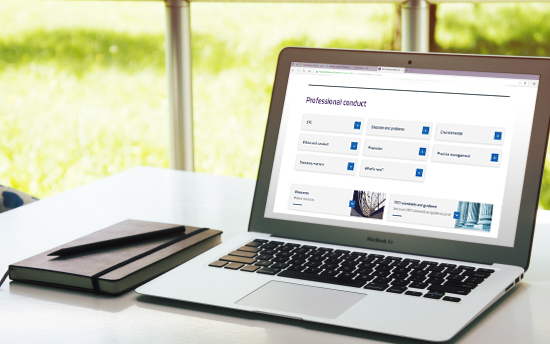 isurv Professional Conduct is an essential online tool for all chartered surveyors. All official RICS CPD information in one place, including the RICS Rules of Conduct. Understand RICS requirements and offer practical ways of applying the RICS Rules of Conduct to your day to day work. Put solid compliance processes in place, which will help you to manage risk and limit the danger of negligence. isurv CPD allows you to complete informal CPD study carried out on isurv in a time efficient way. Earning CPD hours demonstrates that you have sought to maintain your professional competence and improves your skill set, benefitting yourself and your clients. Still unsure if isurv Professional Conduct is for you?